This years winter in New York was brutal to put it lightly. For a second there, we weren’t sure if it was ever going to end, but now it seems like the worst is behind us as spring is starting to show signs of life in Queens and Brooklyn. Now that the warmer weather is coming, you may want to consider doing a quick inspection on your roof to see how it held up over the winter. Missing Shingles – This one seems obvious, but if your missing any shingles, you should consider having them replaced or patched. Be sure look underneath the sheathing from the attic if you can to ensure that this isn’t being caused by a much worse issue like a rotted deck. 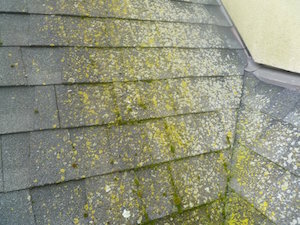 Algae Growth – If you notice your asphalt shingles have a green or black streaking color going down the roof, you are most likely dealing with algae growth. This is evidence that the shingle is retaining water, which it is not designed to do. 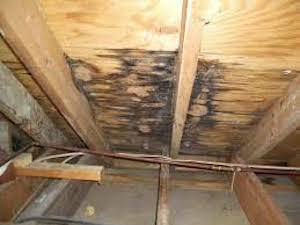 Be sure to keep a close eye on this and the wood beneath, as it may result in rotted sheathing. Loose or Missing Flashing – Look at all the intersecting points on your roof where there is any copper or aluminum flashing. Make sure the flashing is flush against the intersecting wall with no entry points where water can come in. Perimeter Check – Check a few points of the roof around the perimeter to make sure you don’t have any rotted trim wood or sheathing. These points are hotspots for leaks due to gutter overflow and ice dams, so it’s important to keep an eye on the wood around these areas on the soffits, fascia, and eaves of the roof. 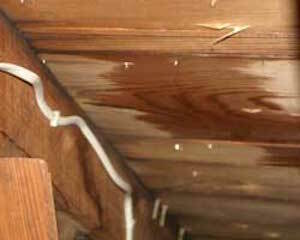 Leaks – The images below will show you what a leak will look like in your attic. You want to get up there with a flashlight to look around the sheathing and rafters for evidence of any water penetration. 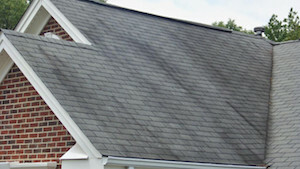 If you see a leak, call some professional roofing contractors in Queens or Brooklyn to have it looked at right away. Cracked Rafters – This is the last thing any homeowner wants to see. Your beams and rafters are a structural element of the house, and if too many are cracked, it can compromise the structural integrity of the house. This is usually due to poor ventilation and heat stress on the beams, in which case you should consider some ventilation options to reduce the amount of heat that gets stored in the attic. If you see any issues described above, be sure to call a qualified Queens or Brooklyn roofer to come by and check it out. Most roofers give free inspections with their estimates, so they’ll be able to assess the issue. If you do, be sure to get a free inspection and estimate from your local Queens roofers, Big Apple Renovators! !